How do I ensure my invoice income isn't duplicated? What is a compound tax? A starting balance is the amount of funds in an account at the beginning of a new fiscal period. When you're entering a bank or credit card account in Wave, you probably don't want to enter or import every single transaction from the entire history of that account. To keep your balances and accounting records accurate, you'll need to enter the starting balance for those accounts on January 1 (or whatever date your business's fiscal year starts). Go to your Transactions page. Click on Add Income (click "Add Expense" if the starting balance of the account is below zero, which means you owe money to the bank). In the Date column, put in the starting balance date. In the Description column, enter "Starting balance". In the Amount column, enter the starting balance amount. 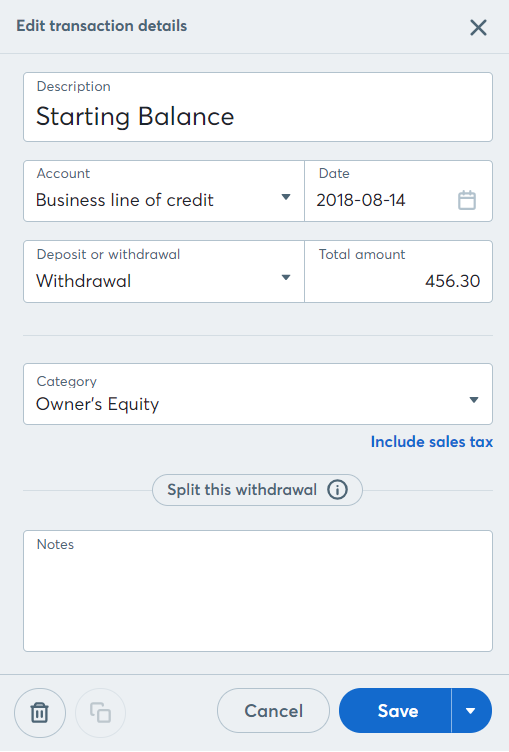 In the Category column, select "Retained Earnings/Deficit" or "Owner's Equity" (your available option will depend on what type of business you created in Wave). In the Account column, select the account for which you're setting a starting balance. Click the checkmark icon to verify your transaction. Click on Add Expense (click "Add Income" if the starting balance of the account is below zero, which means the credit card company owes you money). Choose Deposit from the next drop-down. 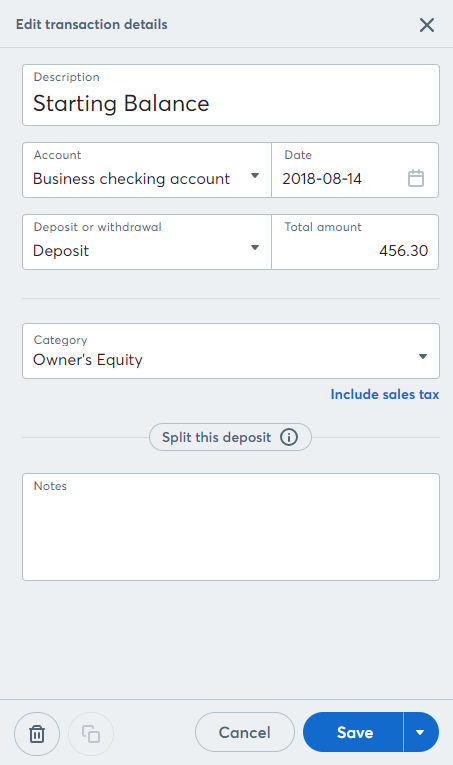 In the Category column, select "Owner's Equity" from the dropdown menu (or an appropriate Equity account for your business). Choose Withdrawal from the next drop-down. Click More > Add journal transaction. If the account is a liability account, enter the starting balance as a credit, and select the liability account you are entering the starting balance for. Enter a debit to your Owner's Equity account for the same amount. 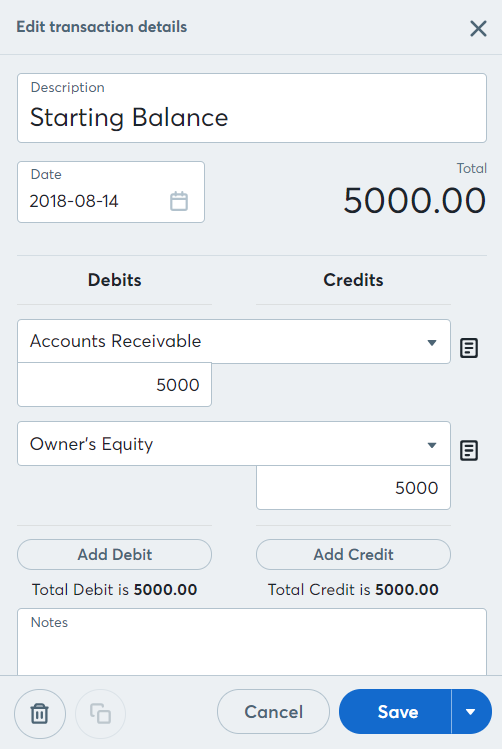 If the account is an asset account, enter the starting balance as a debit, and select the asset account you are entering the starting balance for. Enter a credit to your Owner's Equity account for the same amount. Save the new journal entry. Accounts Receivable is an asset account so the starting balance is entered as a debit. When you connect your bank or credit card, Wave enters the starting balance for you so you don't have to. These starting balance transactions have the description "Starting balance for Account". If you enter transactions with dates prior to this starting balance transactions, then make sure you adjust the date and amount of this transaction so that it is the first transaction of the account. How do I record a check I wrote/received?